On two legs or four, the colorful inhabitants of Tolk project a rustic charm full of whimsical folk- and fairy-tale elements, with just enough unique lore to be freshly compelling. A young boy discovers a hidden portal to a magical realm, befriends a bevy of talking animals, and plans a daring rescue, all while staying mindful of making it home in time for dinner in Lesley Renton’s Cat between Two Worlds, an innovative fantasy adventure that celebrates the extraordinary bonds of friendship and family. When eleven-year-old Price Evans moves from Calgary to Clareburn, Alberta, he is amazed to discover a secret gateway into the enchanted Land of Tolk right in his own backyard. Trouble is brewing among its typically peace-loving inhabitants, and Price soon finds himself in the center of a rebellion that could shatter their idyllic way of life forever. The Land of Tolk is populated with fairies, elves, giants, dwarves, and all manner of singing, dancing, glittering magical creatures, along with a cadre of anthropomorphic animals ranging from mice and squirrels to dogs, cats, bears, and birds in waistcoats, trousers, and ruffled collars. On two legs or four, the colorful inhabitants project a rustic charm full of whimsical folk- and fairy-tale elements with just enough unique lore for a freshly compelling set of circumstances and intriguing new characters. There is a classic dog-versus-cat rivalry between the king of Tolk, a loyal and fiercely protective German shepherd aptly named Noble, and a crafty and curious orange feline called Sinbad who is intent on stealing the crown. Sinbad plots to bring humans and technology through a portal with promises of luxury in the form of refrigerators, shopping malls, and bowls of milk. Given the cat’s mistreatment and difficulties in the human world, and despite his lack of an actual plan or the means to implement it, Sinbad is able to gather a surprisingly large number of followers through his rants and raves, although his constant threats lose intensity after several repetitions. The real treats are the side stories that focus on Price, his new companions Winifred “Freddy” Fairchild and Octaruse Pinecone (“O.P.”), and his grandmother with her mysterious ways. Thoughtful, kind, honest, and remarkably self-aware, Price is a likable kid, and it is easy to cheer him on in his endeavors—like the time he creates an unnecessarily complicated but highly entertaining plan to retrieve two garden gnomes from his neighbor’s yard using a skateboard, electrical tape, Halloween makeup, a screwdriver, and twine, MacGyvering them to safety. Throw in a comedic sidekick made of pinecones, a fairy who is longing for affection, and a scheming cat, and for Price “it might just be the start of something exciting. 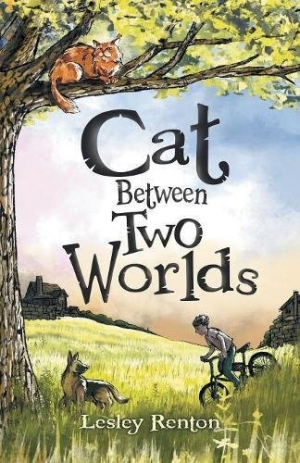 And, whatever it was, he wanted to find out more.” Upper-elementary and middle-grade readers will want to find out more as well as Price and his companions strive to bring peace and harmony back to the Land of Tolk in Lesley Renton’s Cat between Two Worlds.